We eat a lot of pies on the Pierate Ship. Most of them are nice enough, but with such fierce competition it can be hard for any of them to stand out. But just occasionally we come across a pie, or pie company, which we fall in love with. It might just be the little things they do which make us smile, such as special flavours or beautiful presentation. The pies don't have to be perfect, but when it is true love the faults just don't seem to matter for some reason. When you start day dreaming at work about a particular pie then you know you've got it bad. This has happened to me recently. I think I am mad about Mad About Pies. In January we reviewed the Phil Vickery & Mad About Pies Wild Boar & Cider pie, giving it 'Pierate Recommended' status. It then went on to win a Gold Award at the British Pie Awards 2014, which it thoroughly deserved. In British Pie Week SJL visited the home of Mad About Pies at the Farmers Boy Inn in Gloucestershire. The pie there was so good we have been unable to decide just how high we should rate it until we have a second opinion from another Pierateer (so stay tuned). In the meantime we have picked up some more of the Mad About Pies retail pies to review. See below the three pies, all from the Martin Blunos range. 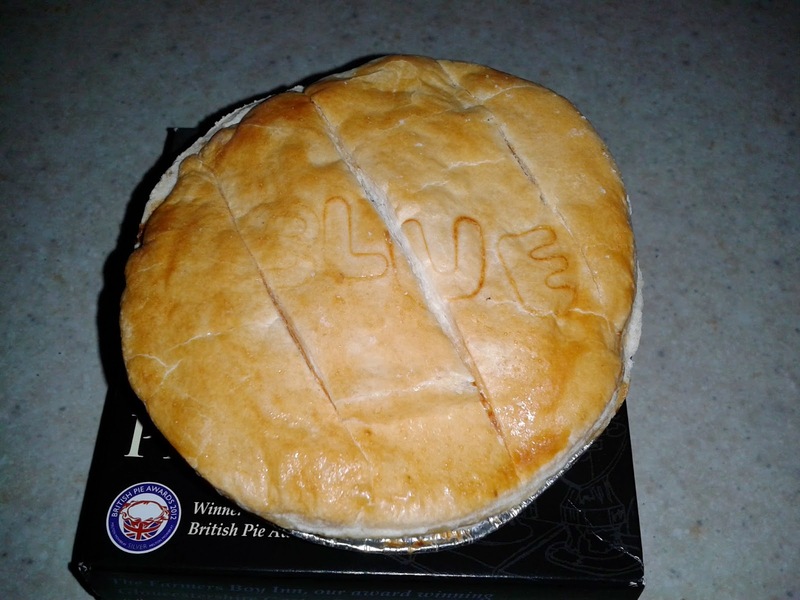 All these pies looked fantastic with writing on the top describing the flavour, similar to the Phil Vickery version. They have shortcrust pastry for the sides and base and a puff pastry lid, a great combination in the opinion of this reviewer. They came out of the oven a delicious, mottled, golden brown Colour. The pie lids all had some scoring across the top, it almost seemed like the Content was trying to burst out of the pie. First up is the Steak & Blue Cheese which had a delicious content. Owner Phil Kiernan says he loves this pie and I can see why. Blue cheese can add a lot of flavour to a pie filling but it can be difficult to get the balance right, often the flavour of blue cheese is over-powering. But in this case the amount was perfect, really complementing the Steak. Condition - 5.8 out of 7 - These pies all looked great, although for this pie the shortcrust pastry sides collapsed slightly on cooking. Colour - 6.8 out of 7 - Great colour to the lid and filling. Cheapness - 4.5 out of 7 - These cost around £3 which is a standard price for gourmet pies. Not overly big at 270g but with quality steak it is good value. Capacity - 5.8 out of 7 - Quite tall but collapsed slightly on cooking making it hard to tell if there was an air gap. Good filling to pastry ratio. Chewiness - 6.9 out of 7 - The slow cooked meat was melt in the mouth. The crispy lid and gooey sides provided a nice contrast in texture. The blue cheese made the whole pie lovely and moist. Content - 6.3 out of 7 - Meaty and cheesy, this pie was a flavour sensation. The meat was in big chunks which couldn't fail to satisfy. I would have liked more meat but I was possibly just being greedy. Consistency - 6.8 out of 7 - All the elements of this pie were good. This pie worked fantastically as a whole, the crispy pastry being kept moist with the running filling. Fully deserving of 'Pierate Highly Recommended' status. 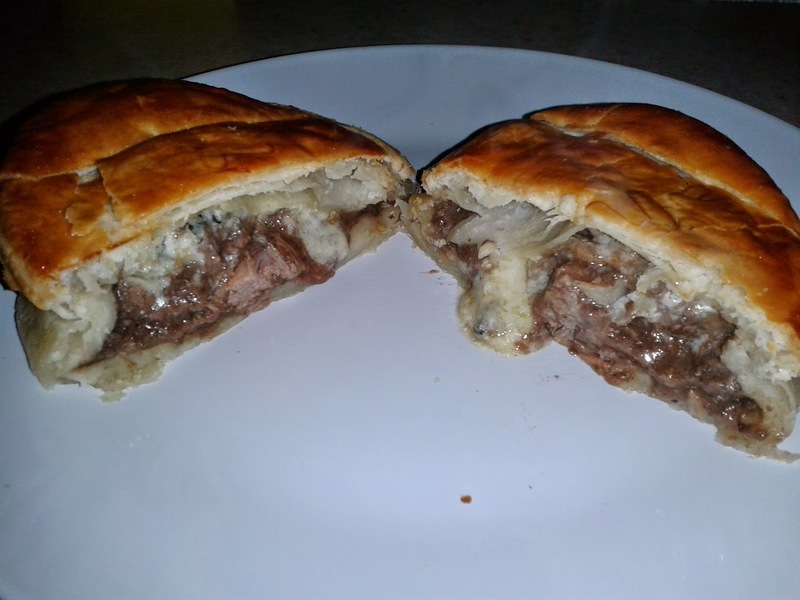 The steak and ale was another great pie, quite similar to the Steak & Blue Cheese but lacked flavour when compared it's blue cheese counterpart. Condition - 6.0 out of 7 - These pies all looked great, this one held it's structure a bit more so it might have been down to cooking time. Colour - 6.7 out of 7 - Great colour to the lid and filling. Capacity - 5.8 out of 7 - Quite tall but there was a little air gap at the top. Good filling to pastry ratio. Chewiness - 5.9 out of 7 - The slow cooked meat was melt in the mouth. The crispy lid and gooey sides provided a nice contrast in texture. Unfortunately the texutre of the sauce was a bit runny. Content - 4.5 out of 7 - Large meaty chunks which are great to get your teeth into. It was pleasing that the taste of ale was clear throughout the pie, however it lacked the flavour punch that the blue cheese version had. Consistency - 4.5 out of 7 - This pie worked well as a whole, although the flavour could have been more intense. It is a pie I would buy again so it is fully deserving of 'Pierate Recommended' status. Lastly was the vegetarian Butternut Squash pie, I have nothing against vegetarian pies but they seem to be more difficult to get right. Condition - 6.0 out of 7 - These pies all looked great, this one seemed to hold it's structure. Cheapness - 3.5 out of 7 - These cost around £3 which is a standard price for gourmet pies. However, with no meat in could this pie be cheaper? Capacity - 4.7 out of 7 - Quite tall but there was a sizable air gap with this pie, but there was still a decent filling to pastry ratio. Chewiness - 3.5 out of 7 - The filling was not at all chewy but it was a little too mushy, some of the veg provided a bit of bite but it really need more crunch. Content - 5.8 out of 7 - The flavour and variety of the content was actually where this pie did very well. It also contained celery and parsnip which added some interest. For flavour there was plenty of onion, garlic and other herbs which worked really nicely. The content was sweet, but not too sweet. Consistency - 3.5 out of 7 - This pie really did taste nice but didn't do enough to make a non-vegetarian want to buy it again. It didn't quite work, but almost. That said, it was nice for a change.